What Will You Think About on Vacation? With the Fourth of July behind us, family vacations crank into high gear as we strive to find some family time before kids head back to school and radio stations compete for the fall ratings period starting September 13. Around that extra time with the family you’ll be focused on programming and promotional plans for the fall sweeps. At NuVoodoo we’re just weeks away from rolling out results of our latest Ratings Prospects Study – initially to clients and then in free webinars. For the past several years, all of our client perceptual studies have shown the alarming intrusion of digital pureplays (Pandora, Spotify, etc.) into radio’s arena. Personalization is a benefit offered by those new players, but lower-commercial inventory is far and away the biggest benefit for listeners. While listeners complain about the repetition of a small inventory of commercials on the new digital channels, broadcasters face comparisons that didn’t exist before the proliferation of hyper-targeted digital media. 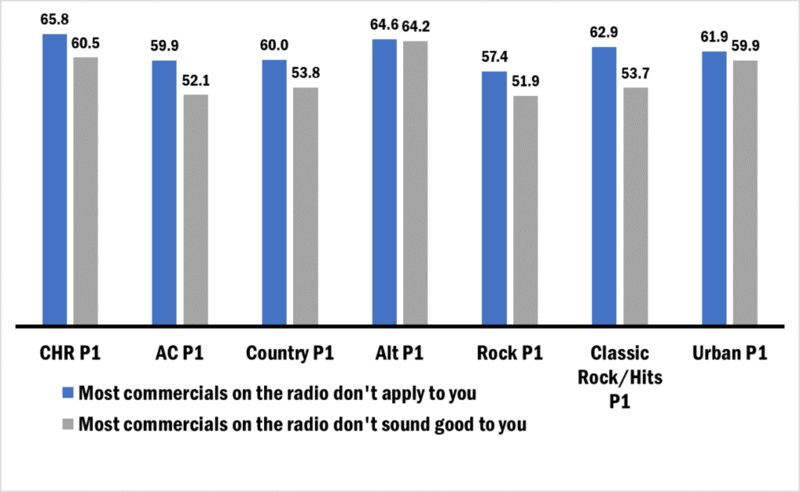 As advertising becomes more personalized and context sensitive, our data has shown that 3/5 of most music format P1’s agree most commercials on the radio don’t apply to [them]. Digital ads now chase us around the Internet, based on our browsing and reactions to Social Media. (That’s something that NuVoodoo does routinely for its marketing clients: as consumers become more comfortable listening to streaming audio on their smartphones, a digital ad – a virtual billboard – can turn directly into a listening occasion.) It’s natural that we’re coming to expect ads that are tailored specifically to each one of us. Now, when a broadcast radio commercial goes on about something far outside our realm of interest, it seems more annoying than that same commercial might have seemed years ago. With sales under more pressure than ever, we’ve largely given up trying to influence the creative choices of clients. It’s not surprising then that majorities of all music P1 constituencies agree most commercials on the radio don’t sound good to [them]. Younger PD’s can’t even remember a time when PD’s could reject spots or have commercial creative changed to suit a station’s targeting.